Instead of using divers who are certified for commercial diving, some dive companies here are taking shortcuts and saving costs by hiring experienced divers without proper qualifications. To close this and other loopholes, the Singapore Standard Code of Practice for Commercial Diving, or the SS 511 code, will be revised later this year, said Mr Abdul Malik, chairman of the Commercial Diving Association of Singapore (CDAS). The SS 511 code was last revised in 2010. The latest revision follows a court case last year where a local diving company was fined $ 125,000 over the drowning death of one of its staff, a former Indian navy diver. Mr Malik told ST that the commercial diving industry is facing a serious problem with companies hiring recreational scuba divers to do underwater engineering or construction work. He estimated that only half of the 200 commercial divers here are trained to meet the SS 511 code. The rest hold recreational scuba or military diving certifications, which are not meant for underwater work. This is even though it has been more than a decade since the national standards were set. Mr Malik, whose association has been championing proper training and certification, explained that firms are reluctant to meet the standards due to the higher cost of specialised training and equipment. “A lot of people in the industry still think of the code as a guideline, not regulation. They do not recognise it as a minimum standard for diving work,” said Mr Malik. In January last year, Cutech Marine Services was fined $ 125,000 for breaching the Workplace Safety and Health Act over the May 12, 2012 drowning of a diver. The company had not provided two-way communications to the man, who had been sent to clean the hull of a crude oil tanker. 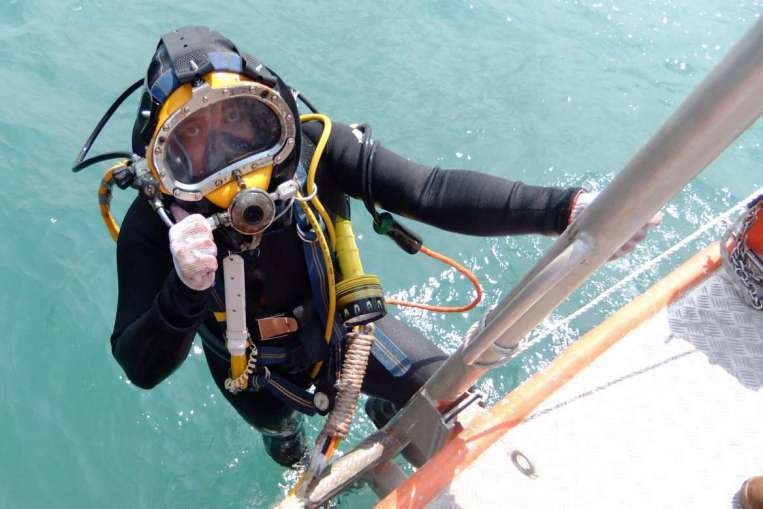 The diver was also using only scuba equipment instead of the required Surface-Supplied Diving Equipment (SSDE) for the type of underwater job when he died. The case was significant as it was the first time the code of practice was brought up in court, said Mr Darren Brunton, group managing director of KB Associates, the only local training provider for inshore commercial divers in Singapore. Compared to scuba equipment where divers carry their own air canisters, SSDE allows for unlimited air supply pumped via “umbilicals” to the tethered diver. He explained that in countries like the United Kingdom and Australia, those who want to join the trade would pay to enrol in accredited diver training schools. But Mr Malik believes the SS 511 code’s effectiveness will be limited if diving firms and those who hire them do not pay heed to it. “Shipping firms should not be oblivious to what their contractors are doing, and diving companies must also be responsible for the workplace safety of their staff,” he said. A MOM spokesman said commercial divers should meet the standards stipulated by the Workplace Safety and Health Council in consultation with the CDAS.